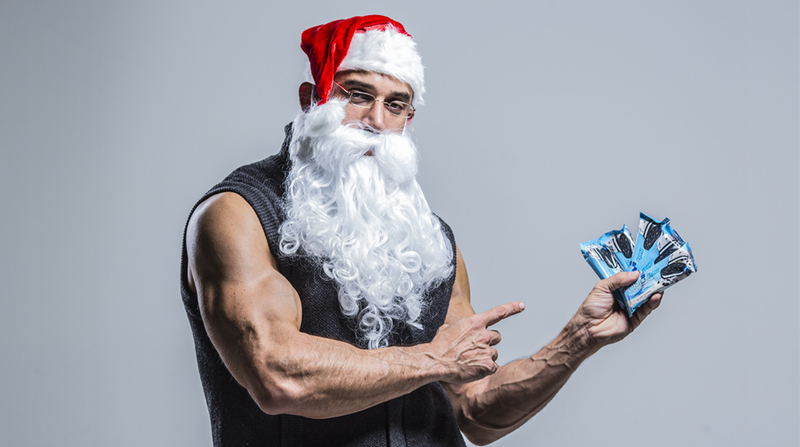 Ho-Ho-WHOA: Santa’s Transformation from Jolly to Jacked! His 5 secret weapons to losing the belly full of jelly. Not to toot my own expertly-crafted-elf-made-horn here, but being Santa Claus comes with its own unique set of stresses. I challenge anyone to deliver presents to two-and-a-half-billion people in a single night and try to maintain a healthy physique. The second I finish I take the 26th off and then I’m right back in the office above my workshop handling the logistics and planning for next year. This has been going on for hundreds of years. No sleep, constant snacking, sitting at my desk under dim candle lights hovered over my laptop (Sound familiar?). Couple that with the caloric requirements necessary to maintain weight in the constant-freezing-temperatures of the North Pole and you can imagine the amount of food I have to consume in order to stay “healthy.” I put healthy in quotes after Mrs. Claus read this because I was in no way, shape or form, healthy. My way was gluttonous eating, my shape was what can be scientifically referred to as “jovially rotund” and my form was nonexistent because I couldn’t touch my knees, much less my toes. st, 2015 I undertook the Santa Weight Loss Challenge. While I had some real doozies of ideas clunking around my old head (Shimmy up the Chimney? Really, Santa? You think you can use only your arms to make your way up a narrow, claustrophobic space…in this shape? Sigh. ), but I finally narrowed it down to a list of five things to attain the results I needed. Now, my good little darlings, I’d like to share my list (and my results) with you! Many people don’t realize that I don’t actually live on the North Pole. I tried that once, but six months of no sunlight is enough to drive even Jolly Ol’ Saint Nick mad. While I can’t tell you my exact location for obvious reasons, I do use a tundra of trees to tone my core. Most folk think that chopping wood is going to blast your arms, when it’s actually more of a core/cardio workout. A full hour of chopping wood, a.k.a. enough for two days in my parts, burns roughly 400-500 calories. The most effective method is to use the power of your core to raise the ax over your head. One hand should be at the bottom of the ax (usually your non-dominant hand) and the other should be near the head of the ax. Instead of letting gravity pull it to the wood, you need to pull the ax down, never losing eye contact where you want the blade to land. Repeat this a couple hundred times and you’ll feel it in the core and shoulders. I know most of you don’t have an abundance of trees at your disposal, but you can simulate the experience of a lateral wood chop at the gym by using the standing cable and mimicking the wood chopping motions. It’s a fantastic way to obliterate your obliques and you won’t have the guilt of defacing a forest. Sure, I can target all of my major muscle groups and see incredible results. I can change my diet to focus on protein and pursue excellent macros, but I wouldn’t be Santa without milk and cookies. Imagine my surprise when Mrs. Claus (always looking out for me) introduced me to No Bake Cookie Dough! Each batch packs 25 grams of protein per serving, 200 calories and six grams of net fiber, which, is a big bonus for Santa, and when I pair it with almond milk I significantly reduce my sugar intake. Also, you’re guaranteed to be on the nice list next year if you leave a Cookies & Cream Quest Bar on the table for me this Holiday season. Just saying. While I have a 500 yard runway for takeoffs and landings, I used to miss out on a great workout and assign shoveling duty to 20 unlucky elves (They all have hot girlfriends now and are “too good” to do Santa’s busy work.). But a combination of their tiny bodies and shovels along with the fact that they only have a four hour workday (I’m a very kind boss), I would end up having to finish the rest myself. I turned this negative into a positive once I realized I could transform this task into a healthy workout that targets all the major muscles. However, you must take extra precaution to ensure you’re using your legs for the lifting or you can succumb to lower back injuries. The best way to hone this is to do a snow shovel squat. Drive the shovel into the snow, drop your hips, keeping your knees over your toes, brace your arms and your core, and lift the snow using your legs, then toss it backwards over your head. You end up working your legs AND shoulders! Repeat this on the way up and across your runway…er, driveway, and your legs will be like the tree trunks you just fake-chopped in the first exercise. I like to alternate sides every ten scoops of snow to ensure both sides are getting the proper attention. After a couple weeks I changed my shoveling form and integrated lunges with each scoop to work my quadriceps, glutes and hamstrings. I know what you’re thinking, “Hey Santa, where do you get sand in the North Pole? !” Need I remind you that I make many stops along coastal areas and until last year, I always thought the sand buildup would slow down my delivery time (I’m looking at you, Hawaii). However, I’ve transformed the stowaway grains into exponential gains. Now, thanks to sand I’m a lean, mean, gift-delivering machine. The best part about sand is that it’s literally dirt cheap. All you need is something to put it in and you’re set. Me? I use my toy bag, but any duffel bag or even garbage bag will work (with the latter, I’d double up, just to be safe ;). I suppose you could buy the fancy ones at sporting goods stores that are pre-loaded and weighed, but don’t ask me to tote them around as a Christmas gift (sleigh fuel ain’t cheap). The best part is you can tailor the sandbag to target your arms, shoulders and back, and I have even been getting into leg lifts with sand! Personally I enjoy the intense arm/shoulder/back combo attack I get with bent-over rows. I grip the side of the sandbag with a strong fist and get into deadlift position (bend those knees and keep that back stiff!) Using your biceps and lats, pull the sandbag up to your lower ribs. Now, the best part, slowly lower the sandbag back to the ground and watch those arms quiver! Since there’s no 24 hour gyms within a 500 mile radius, the sandbags are my go-to for a few quick reps to nail my target areas.